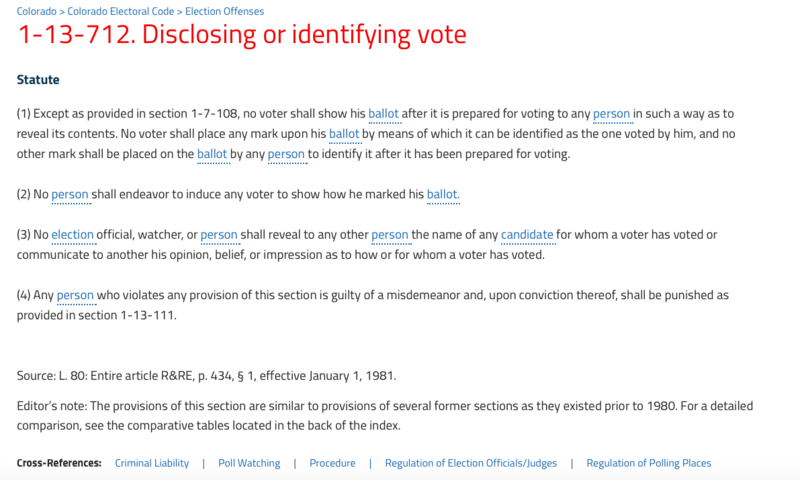 In 2016, Caryn Ann and several other defendants sued the Colorado Secretary of State, State Attorney, and Denver Attorney General over a Colorado statute forbidding the disclosure of the contents of one's own ballot. This came in the wake of multiple similar suits, including a successful overturning of a similar law in New Hampshire. View a copy of the Complaint and the Order for Injunctive Relief as well as a copy of the Colorado statute that was overturned. Caryn Ann is an ideological anarchist/voluntaryist who has become distinguished for presentations on the Dallas Accord and the Statement of Principles. She is also widely known as a pro-life Libertarian having authored "Abortion and the Libertarian Conscience." She is also a pacifist, but this is for religious, rather than political, reasons. Caryn Ann has been a public face for the Radical Caucus and was a key mover in its formal organization prior to the 2016 National Convention. She was its Colorado State Coordinator from 2016-2017. She no longer maintains membership in any caucus believing that Party officers need to steer clear from any appearance of factionalism. Arizona Libertarian Party, January 2017. Montana Libertarian Party, March 2017. Libertarian Party of Colorado, March 2017. Libertarian Party of New Mexico, April 2017. Alaska Libertarian Party, May 2017. Libertarian Party of Oregon, June 2017. Libertarian Party of New Hampshire, April 2018. Libertarian Party of Ohio, May 2018. Arizona Libertarian Party, January 2018. Libertarian Party of Washington, February 2018. Libertarian Party of Louisiana, April 2018. Libertarian Party of Oklahoma, April 2018. Libertarian Party of Utah, April 2018. Libertarian Party of Texas, April 2018. Libertarian Party of California, April 2018. Libertarian Party of Indiana, May 2018. Libertarian Party of Massachusetts, September 2018. Libertarian Party of California, scheduled for April 2019. Libertarian Party of Colorado, March 2018. Roads to Freedom Unconvention, May 2018. Libertarian Party of Alabama, June 2018. Caryn Ann has a YouTube channel Pink Flame of Liberty and also hosts the Big L Podcast. Caryn Ann also creates tutorials on how to participate in various Libertarian Party activities. Using a New Jersey quarter which Mr. Redpath purportedly obtained from The Sopranos on his last visit, Mr. McKnight conducted the coin toss, and Ms. Harlos called the “New Jersey / tails” side of the coin. Ms. Harlos won the coin toss, thus she was appointed to the fifth position on the Platform Committee, and Mr. Starr was appointed as an alternate. With 11 votes out of 18 ballots cast, Caryn Ann Harlos is elected as committee chair, having received a majority vote. On February 28, 2018, Caryn Ann announced her run for LNC Secretary and launched her campaign website in March 2018.. Her campaign is managed by Sarah Daggers. She won against incumbent Alicia Mattson and fellow challenger Jeff Wood on the first ballot with 56.621% of the votes. Caryn Ann's campaign was ran with zero negative campaigning and in fact she was cited by Alicia Mattson in Mattson's campaign materials as someone who called Ms. Mattson "one of the best secretaries" she has ever worked with. Popular Libertarian evangelist Larry Sharpe endorsed Caryn Ann for this position. Caryn Ann is a paralegal with over twenty years of experience. She has also authored a book on Christian eschatology that had been used as a reference work in a class at Liberty University. She has appeared in radio shows and podcasts all over the world on this topic and was a guest lecturer at Appalachian State University. Caryn Ann has been involved in various other non-profit activist and service organizations including volunteering for a teen runaway and suicide hotline, regular head and assistant cook volunteer at Gold Coast Via de Cristo events, and served as Treasurer on the Gold Coast Via de Cristo Secretariat, as well as archivist of its banner collection spanning multiple decades. ↑ "Ballot Selfie Ban Violates Free Speech Rights", "FPP News, Volume 7, Issue 11"
↑ "Caryn Ann Harlos on the LP Statement of Principles", Libertarian Party, May 3, 2017. ↑ "Did the Libertarian Radicals Lose Their Inter-Party Fight? Not So Fast, Says One"
↑ "How "Terrible" Trump and Clinton Help the Libertarian Party in Colorado and Beyond"
↑ Party-Archy, the Libertarian Wing of the Libertarian Party"
↑ After 2016, Where Is the Libertarian Party Today, and Where Is It Going? ↑ "Did the Libertarian Party Blow It in 2016? ↑ "Find What You Love and Let it Kill You"
↑ "The Libertarian Party's Paid Membership Numbers Take a Dive"
↑ "Ask Me Anything Part 1"
↑ "Ask Me Anything Part 2"
↑ "Why you should care about the Libertarian Party in 2016"
↑ "The People vs. Capitalism"
This page was last edited on 29 March 2019, at 06:04.